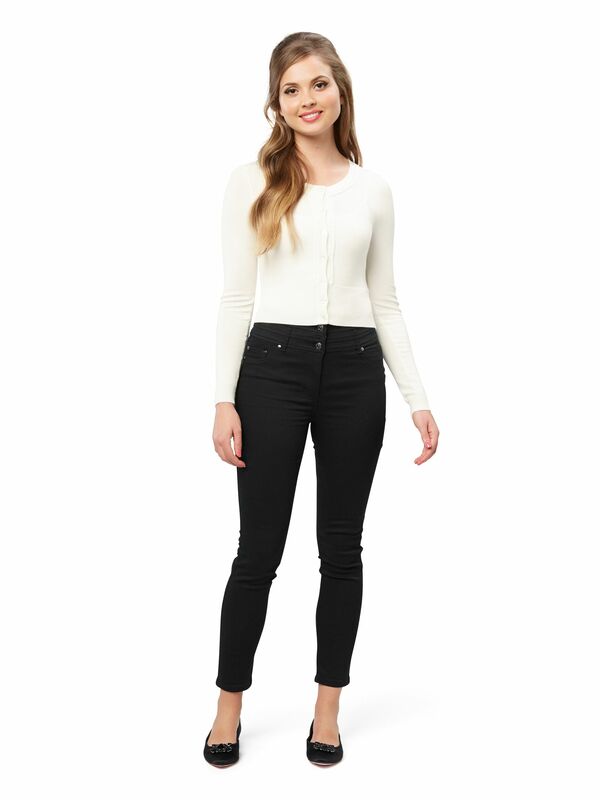 Chessie Long Sleeve Cardi https://www.review-australia.com/au/chessie-long-sleeve-cardi-cream/RE15KW217.RECRM001.html The perfect cardi for any occasion, the Chessie Cardigan is a classic Review style in fresh new colours. It is a slightly cropped length with a wide hemband, cute embossed dot details and buttons dyed to match perfectly. .
Chessie Long Sleeve Cardi is rated 4.9 out of 5 by 141. Rated 5 out of 5 by Elle22 from Glamorous with exceptional comfort This short waisted cardigan is flattering and perfect for any occasion, from casual events to an evening wedding. Best purchase I’ve made this year. Rated 5 out of 5 by MillyClo from Must have wardrobe staple knitted black cardi I love this black knitted cardigan! This is my second one, after leaving my first one in a taxi.... #SadFace It fits perfect to size and having bought this product before I knew the knit fabric kept well. It doesn’t become stretched and no little woolie balls appear, that normally happen over time, which always makes your knits look old. #SadFaceAgain I wear this cardi regularly, both at work in a corporate office environment and socially on weekends, throwing it on with singlets and jeans. A well fitted black knitted cardi is a wardrobe staple! Rated 5 out of 5 by Jude8B from Super comfy and great fit I previously bought this cardigan in the black colour and being mid season weather started using it quite a bit. What I loved was the material. I have slightly sensitive skin and even though it is a mixture of viscose/nylon it is super comfy. Loved it so much I also purchased the cream colour one the next week. Great staple accessory for my wardrobe and goes well all my outfits. I know I will get my wear out of both of these cardis and was tempted to buy the 3/4 sleeve one, but resisted for now. Very pleased with my purchases. Rated 5 out of 5 by Sweetpea89 from Beautiful quality and perfect fit I bough this a few weeks ago and I love it! It fits wonderfully, is so soft, comfortable, and stylish! It is also versatile, and looks great with dresses, skirts, pants - whatever! Rated 5 out of 5 by Gabbie77 from Best. cardi. ever. I am in love with this cardigan. It is a beautiful shade of red, soft to the touch, and with lovely details around the neck and buttons. I love wearing retro and rockabilly dresses, so the fact that it sits perfectly on my waist is a dream come true. It really makes my outfits pop, especially my black or rose-print dresses. It looks even better now that winter is coming and it's stocking season (at least, in Hobart). I can't recommend it enough! Rated 4 out of 5 by Aprilrose from Great fit and beautiful colour I own several Chessies in different colours, the current vibrant purple is a very welcome addition to my wardrobe. It fits well, I alternate between a 12 and 14 in dresses and tops, but I always go up to a 14 for my Chessies. This one I have given 4 stars, as I found it has pilling around the underarms and I found the sleeves lost their shape after just one wear. I have not had this issue with any previous Chessies I have purchased. Rated 5 out of 5 by Nics from Flattering Fit I love these Cardis. They are very flattering being a cropped fitted fit, they show off your curves and nip in at the waist. I find them very warm and comfortable to wear. THOUGH I do have to hand stitch the buttons on firmer before the first wash and wear as I have lost a button in the past as they were not stitched on well enough and came off on the first wear. Apart from that they are fantastic quality and wash and wear well.